February is known in several parts of the world as the month of love and friendship. Although February 14th is celebrated as Valentine’s Day, love and friendship in all its expressions should be celebrated every day! What better way to spice things up, celebrate an anniversary or grow closer together than by enjoying an exciting adventure together to Cuba as your new destination? The island offers something for everyone. Art, history, culture, love, and passion are in the air! This February is the perfect time to travel to Cuba and have an adventure on this beautiful island. To help you plan your upcoming trip during the month of love and friendship, here are the 10 Most Romantic Things To Do While in Cuba. Get lost together down the streets of Old Havana. Old Havana is as rich in history as it was frequented by the rich and famous during its heyday in the 1950s. You may not know that the city of Old Havana was also named by the UNESCO as a World Heritage site for its contribution to humanity. I have always found old world structures to add an air of romance to every trip I have ever taken. As its name says, Old Havana overflows with colonial architecture and structures. Some of the building facades have maintained their original coats, where the colors have been beautifully bathed by the sun, sending us back to a different time when romance was about courtship and formality. Get lost with your honey and take a stroll by the Capitolio Nacional, the Great Theatre of Havana, known for the world-famous National Ballet of Cuba, the Museum of Fine Arts, and the Cathedral of Havana. Continue to the Palacio de Los Capitanes Generales, the Castillo de la Real Fuerza, the Iglesia del Espiritu Santo, the Church of Angel Custodio, and celebrate with a drink at the Floridita Bar. Many tours and excursions are available to enjoy these activities together. Perhaps the 3.5 hr. Havana’s Highlights excursion is right for you or a Walk Through Old Colonial Havana will help you get to the most treasured sites. If you prefer the lights and sounds of the evening, An Evening Stroll Through The Historic Center of Havana is available too. Options abound! Take a ride in a classic car. Havana, Cuba is a top destination to get in touch with the glamorous 50s Cuba is remembered for. Some of the elements that have been maintained since their heyday are the classic American cars. Lucky for you and your travel partners, it is possible to take a ride in a classic car down the streets of Old Havana. The A Ride Through Havana on American Classic Cars excursion allows for a four-hour panoramic tour of the most important spots around the city, with stops to explore Chinatown, enjoy ice-cream at the traditional Coppelia, and to toast to a great day by enjoying a Cuban cocktail. Go walking along the Havana Malecón at sunset. A memorable sunset gives us a magical moment where the light is picture-perfect, and the sun warms our skin just before being completely engulfed by the water on the horizon. Perhaps you may even steal a kiss or share an embrace with a loved one to mark the moment. 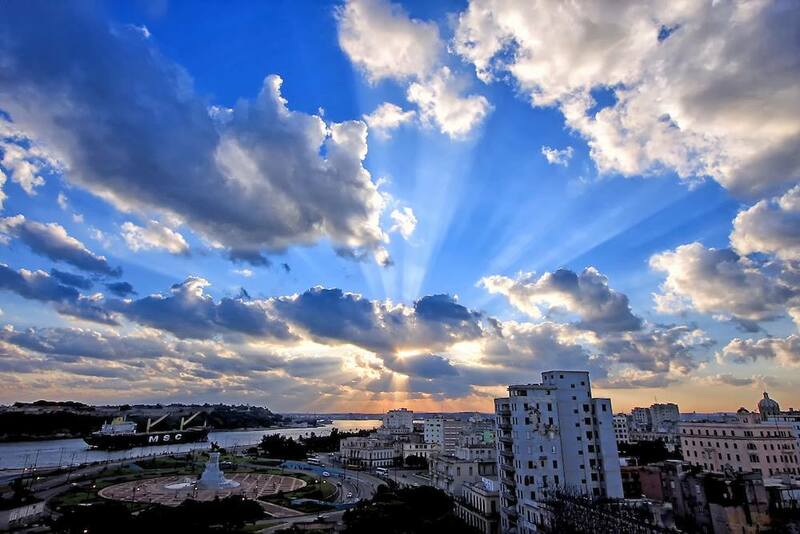 The Malecón in Havana is known for its beautiful sunsets by locals and foreigners alike. The history of the Malecón dates to its construction in the early 1900s, with its completion in 1902. Aside from being a boardwalk, the Malecón also serves as a seawall. Waves can often be seen crashing in during times of high tide. It is a stretch of approximately 5 miles that starts at the Havana Harbor and ends in the historically upscale Vedado neighborhood. The Malecón is a point of interest and a meeting point for locals and tourists. It is common to see people strolling and perhaps even enjoying some of the lively street festivals and impromptu performances. Enjoy live music on the streets. Cuba has always been bursting with immense talent. If we remember, Cuba is the birthplace of big international talents such as Celia Cruz, Gloria Estefan, Desi Arnaz, amongst other greats. Some may recall dancing or singing along to Celia Cruz’s La Vida Es Un Carnaval, or perhaps even tapping to the best of The Miami Sound Machine and the vocals by Gloria Estefan. One is undoubtedly in for a treat while strolling the streets of Cuba. Although there are some organized festivals, such as the Annual Jazz Festival, it is common to see a wide range of street musicians, from guitar players to ensembles playing a variety of instruments. Maybe it’s a once in a lifetime opportunity to learn a new tune and perhaps even take a spin or two while enjoying beautiful music, together. Take a cooking class together. Cuban cuisine blends several influences from the Caribbean and the old world. If you have already visited the blog The Essential Guide to Enjoy Food Like a Cuban, you’ll understand that sometimes love happens at first bite. Perhaps you have already had fun in the past rolling sushi together. Now it is time to learn about new Cuban flavors and take in their history and culture. Cuban food has a lot of heart. The warm and friendly Cuban people cook with friends, family members, and always make room for unexpected guests, since where three eat, four can too! Several locations offer “farm to table” cuisine, using the freshest ingredients possible. For those that want to enjoy this culinary adventure together, excursions are available for the farm to table experience, as well as learning How To Make a Cuban Mojito and Ajiaco tour. If you and your loved one are foodies, you will want to check out the Yuca and Mojito tour for a four-day Cuban Cuisine extravaganza that will make your palate dance in delight. If you didn’t know, Cuba is also the birthplace of the salsa and rumba rhythms. Salsa is a variation of the Cuban “son,” but also adapts influences from Afro-Cuban rhythm and other genres, as does the rumba. You may be familiar with both styles through international dance championships and televised dance competitions, such as Dancing With The Stars. These styles of dance are known for being very sensuous, where the men often lead, and the ladies can exude grace and flair. Both are fun to try even if one or both of you being introduced to these styles of dance for the first time. One opportunity to test the waters and also to watch the pros and gain some tips is to enjoy Dancing With Havana Compas Dance Company. This excursion is inclusive of the most important sites around the Old Havana, a tasty cocktail, and leaves you relaxed to enjoy a lively dance performance. You may even want to try a few steps and ask the dancers how they make it look so easy! If you are a couple of art lovers, collectors, artists or if you just love someone who loves art, know that Cuba is home to unique and talented artists. Imagine these artists being shaped by the rich culture and the influences that this Caribbean island holds. Their chosen areas range from sculpture to plastics, mixed media, and so much more. Cuba is also home to the Biennial every two years, which gathers artists from all over the world and promotes Caribbean and Latin-American artists. You can have an exclusive insider’s look that combines the best of historical Cuba with the best of Cuban art by participating in the Biennale Art at Havana group program. For four nights and five days, visit the studios and the artists behind the pieces for a highly curated art experience. Excursions are also available to visit local artists and sometimes even meet and talk to the artists themselves. Famous Cuban visual artist Michel Mirabal welcomes visitors into his studio gallery, Finca Calunga. During this excursion, guests can attend a talk by the artist, and close with lunch or dinner at the venue. Step Into History & Make New Memories. Cuba has also been home to many notables, one of the most famous is American author Ernest Hemingway. He spent so much time in Cuba, and it was so dear to his heart, that he was considered an honorary citizen. You and your love can walk hand in hand across Havana and then step into history to make new memories during the Following Hemingway’s Steps at Havana excursion. Tour the city and then venture into Hemingway’s home. See the desk where he worked, enjoy an afternoon at the local spots where he was seen many-a-times, and enjoy a cocktail like he did – like the best of them! Capture All Your Moments Together. Aside from building memories together during a romantic trip or a friendly bonding experience, sometimes the best way to capture memories together is through pictures. Make sure to capture images of yourselves riding in classic cars, remembering those Instagram-worthy moments cooking together and of course, eating! Other great opportunities are to catch yourselves watching the sunset on the Malecón, dancing on the streets, and taking in the beautiful sites. Perhaps you want to remember someone who made your experience better or someone who shared a personal story that made you laugh or connect more with a loved one. Once at home, remember to share the experience with your loved ones and allow them the gift of travel! On our next blog, we will cover the best ways to get around Cuba! From the charming Coco Taxi to the colorful classic American cars that are museum-worthy, and many other options only available in Cuba. Join us on our next ride to learn more about the origins of these forms of transportation and why you should travel in style during your visit to Cuba, a car lover’s and an innovator’s dream!